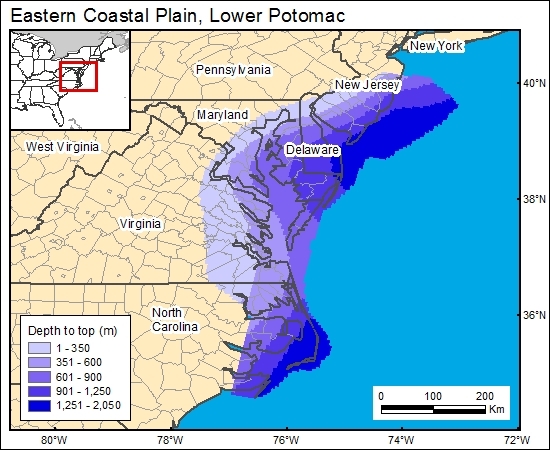 A number of maps show the elevation at the top of the Potomac aquifer (Gill and Farlekas, 1969; Brown and others, 1972; Trapp and Meisler (1992; Trapp, 1992). We chose to use the map of Trapp and Meissler (1992; their plate 7B) because it covers the entire region and clearly defines the hydrostratigraphic unit. We then used a DEM generated from Digital Terrain Elevation Data (National Imagery and Mapping Agency, 2000) to calculate and grid the depth to top of the Potomac brine formation (c1potomac).